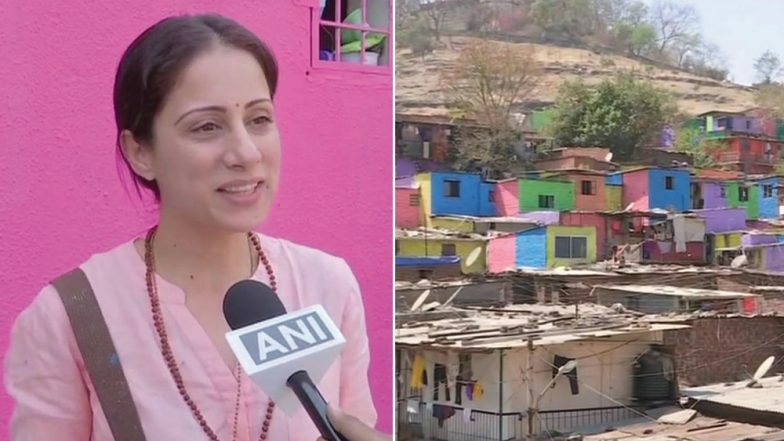 Pune, March 8: With an aim to change the mindset of people, a Mumbai-based artist painted the streets of Pune city in Maharashtra under the 'Misaal Mumbai' initiative. Under the initiative, the artist, Rouble Nagi, who is also a founder of NGO Rouble Nagi Art Foundation said she wants to connect to people through art. "Our main aim is not to colour the walls but bring a change in their mindset", she was quoted by ANI. "When I paint 20 walls here, 200 people come & stand with me. I go to their home as a social activist and try to help, they'll have that speculation that who is she. So we start with colouring, they come out of their homes, & that's when we tell them what we want to do", Nagi added. CR Paints Mumbai Local Train's Womens' Compartment With Colourful Art, Twitter Says It Will Soon Turn Red Due to Paan Stains. 'Misaal Mumbai', is an initiative that is aimed to improve the quality of life for poor people living in slums. It involves providing hygienic living conditions, beautifying their homes, along with repairs, waterproofing roofs and improved sanitation. Along with a team of local painters from the area, Rouble executed the painting after discussions with the residents.